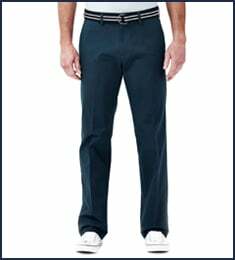 Big & Tall Cool 18® Heather Solid Pant is rated 4.8 out of 5 by 12. Rated 5 out of 5 by scudrunner from great product At first I was afraid to order on line, but after I got the pants my fear was gone. They fit perfectly and exactly as advertised. 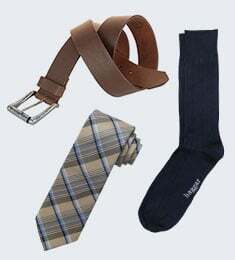 The key and most important point is to give the correct pant size with the order. If not sure, got to a local store and try some on to get the correct size then you will know you will get the perfect fit. Rated 5 out of 5 by beach pops from grat pair od slacks I brought these mainly cuz I am a an overweight guy and I like their expanding waist feature.These fit me perfect.I will now shop for jeans and shorts on their site.Yep they are expensive but not when on sale. Rated 5 out of 5 by 1madman from Haggar Cool 18 I first bought the about 10 years ago. 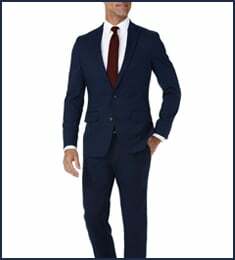 I try other brands but keep coming back to Haggar. Rated 5 out of 5 by squirrel from Haggar mens pants. I bought 2 pair of these pants for my son to give as a birthday gift. He likes the comfort they give him with the hidden expandable waistband. These pants come in lots of different colors and they have the 29 inch length he requires. I have been buying these pants for him for many years. I highly recommend these. Rated 5 out of 5 by Ed64 from AWESOME !! These pants are AWESOME - Really good fit, and look GREAT !! 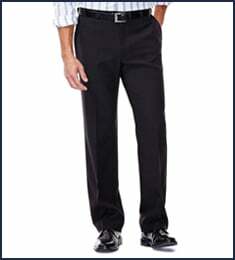 Rated 3 out of 5 by DrBill from Heavy creases in a no-iron fabric Good fit in waist, length and thigh. I like the expandable waist feature. The fabric is polyester and priced accordingly, but the pants come folded, and are deeply creased at the folds. They needed professional pressing. These trousers could have been sent with gentle folds; no need to press in a fold.....not at all.